If you know Glutathione or GSH, you know it’s an ultimate antioxidant found in every cell of your body. It’s produced naturally within your body if you have the right pre-cursors (or ingredients) available to create it. Antioxidants do good work, Glutathione is an excellent antioxidant… Sounds like a plan for success! A free radical is a molecule that has an unpaired valence electron. The electron shell surrounding the molecule is ‘dangling’ or ‘open’. In most cases, there ARE exceptions, this means the molecule is ‘reactive’ and will try to fill that gap by stealing an electron! This process has biological and chemical implications and is an important part of our world… but like anything… can cause trouble! Specific free radicals are known as ‘reactive oxygen species’ like superoxide and hydrogen peroxide and they can cause cell damage. Again a natural by-product of different bio-chemical processes like metabolism of oxygen. Unfortunately if allowed to build up, or if your body does not have enough antioxidants to plug the electron holes, these free radical reactive oxygen species can cause damage! So we want to know what is reduced glutathione and what role does it play with these ROS’s and free radical damage. Reduction is a process where oxygen is lost and hydrogen and electrons are gained, so reduced glutathione is missing an oxygen molecule but has an extra donor electron! Basically the GSH molecule needs to be in a reduced state so that it is available to neutralize free radicals by bonding it’s extra electron to the reactive oxygen species molecules ‘dangling’ free radical electron. This reaction is far from the end… the GSH molecule actually once oxidized (by binding to that ROS), will now be known as glutathione disulphide. 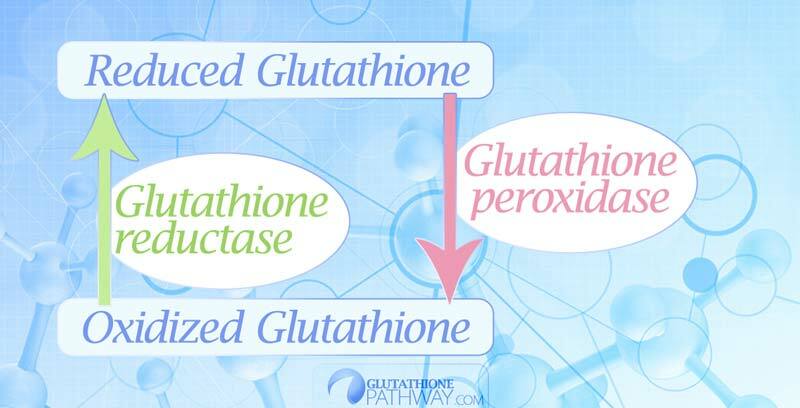 The glutathione disulfide will go through an enzyme reaction known as glutathione reductase that reduces the molecule back to reduced glutathione! This is what makes glutathione your body’s best antioxidant. The important part to your health, is having a good ratio of 90% or more.. of reduced glutathione to oxidized glutathione. That ratio means your body has sufficient stores to battle of ROS that can build up and cause inflammation, to provide your liver with detoxification and enzyme transportation, and to protect your cells! Now you know what reduced glutathione is and you know it’s among the most powerful antioxidants in the world. So increasing your glutathione levels in a safe way from a verified source in supplement form starts to make really good sense. BUT THERE IS A CATCH! Your body won’t easily absorb reduced glutathione. It gets broken down in your stomach before it reaches the blood and can be of any real use to you. Thankfully there are new supplement alternatives like lipisomal glutathione and acetyl-glutathione that will protect the reduced GSH molecule allowing you to raise GSH levels in your body and experience all the potential health benefits! Do you know about Immunocal?